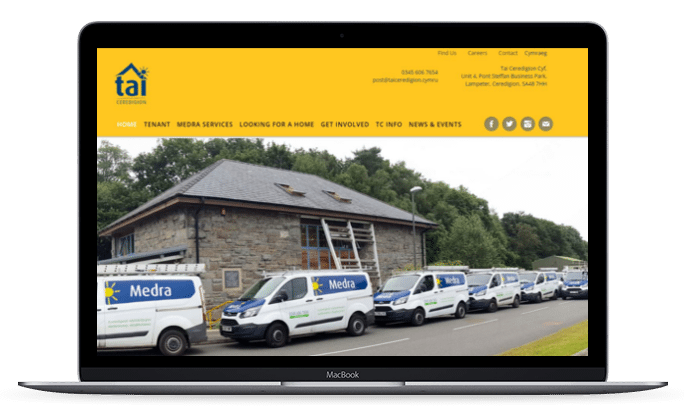 We provide high quality bilingual website design in Wales for businesses, communities, organisations and many others. A website is an important part of any business, as the internet grows in importance in your customer's life, searching online is a natural avenue for those looking for services and businesses. Your website is also a way customers can see and visit your business, it acts as an "online shop window" and is open 24 hours a day, 7 days a week to visitors. Due to this it is important to invest in your website. For information on our full website packages please click here, or for seperate services click here. Responsive website design - your website will adapt automatically to different screen sizes (including tablets and mobile phones). Not only is this important in the ever growing popularity of using tablets and mobile phones for shopping and internet browsing, but Google also give responsive websites an advantage over ones that aren't. Basic SEO on set up - for every website we build, we will also set up a basic search engine optimisation throughout the website. SEO involves using key words and meta data throughout the website to help your website be found online by all major search engines. We also offer more comprehensive packages for SEO, click here for more information. Customised contact form - all of our websites include a standard contact form, which can be customised to your websites' needs, for example a hotel website might require to know the arrival date and length of stay from their visitors. Google map - we can embed a Google map onto your website with a range of features, showing local attractions/activities, or giving a helping hand in directions from home to location. Secure SSL Certificate - free of charge, we make sure your website has a secure SSL certificate from the beginning. Accessible website as per the DDA - websites are expected to comply with certain regulations outlined in the Disability Discrimination Act (1995), making websites usable and accessible to all. We ensure that our websites comply with the regulations, and this is included in the website design cost. Submission to search engines - every website we design and create will also be submitted to all search engines, including Google, Bing and Yahoo. This won't be done until the website is ready and you are completely happy with it. Hosting on UK servers - we use UK servers to host your website, meaning your site will load quickly. To see our hosting packages click here, or get in touch for more information.